In the shadow of the iconic Alabama Theatre marquee on Third Avenue North sits Shu Shop, Birmingham’s latest (and only) izakaya — an informal Japanese gastropub. 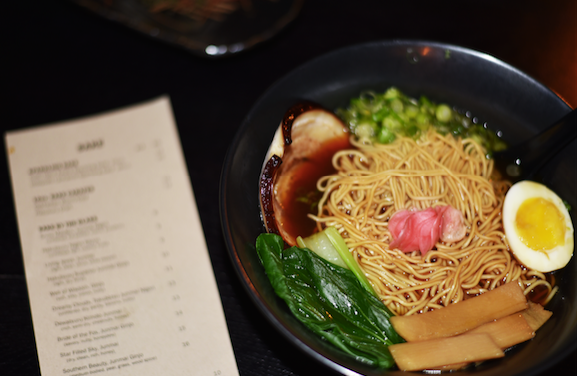 On a Thursday night, patrons line the bar and crowd into booths, where they sip sake and savor warm bowls of ramen noodles. Shu Shop, which translates to ‘alcohol shop’ in Japanese, opened in late July. The idea for the late-night eatery came from a marriage of two concepts — a vision for a laid-back bar and a passion for noodles. Shu Shop owners Jason Templin and Adeeba Khan first met as co-workers at Sakura, the now-defunct Japanese restaurant in Five Points. After Sakura closed, Adeeba went to work at The Garage Café and Jason at Whole Foods. Sometime after that, they decided to team up and infuse some Japanese cuisine into Birmingham’s growing restaurant scene. The overall ambiance of the place, Adeeba says, is meant to be pretty straightforward. She and Jason aren’t necessarily looking to do anything radical at the restaurant. They just want to offer a quiet hideaway where folks can enjoy quality food and good conversation. The menu is a tasty testament to that minimalistic mantra. Keeping with the izakaya tradition of small plates complemented with a steady stream of drinks, the menu features a wide range of authentic Japanese dishes. Adeeba says Jason has studied Japanese cuisine for some years — and his detailed attention to authenticity is obvious in each beautifully plated dish. The menu is broken up into three sections — snacks, small plates and noodles. In the izakaya tradition, customers order several rounds of small-portioned food before moving on to something more complex. This style of eating is meant to encourage meandering conversation and a more relaxed dining experience. Of course, Adeeba says, she wanted to put a twist on the overall ambiance of the restaurant and incorporate some of her own style, too. After scoping out several downtown locations, Adeeba says she and Jason decided Third Avenue North was the perfect spot for their soon-to-be Japanese tavern. Tasked with turning the narrow space into a bar, they looked to local designers at Appleseed Workshop. Wishing to keep with the intimate, late-night bar aesthetic, Adeeba says she opted for dark colors and dim lighting. “The downstairs layout was all us, but Appleseed came up with the upstairs — which is ridiculously awesome,”Adeeba says of the two-story restaurant. Shu Shop is located at 1820 Third Ave. North, Birmingham, AL 35203. Hours are Monday through Saturday, 5 p.m. to 2 a.m.; closed on Sunday. Learn more at shushopbham.com, or call Shu Shop at (205) 291-6660.